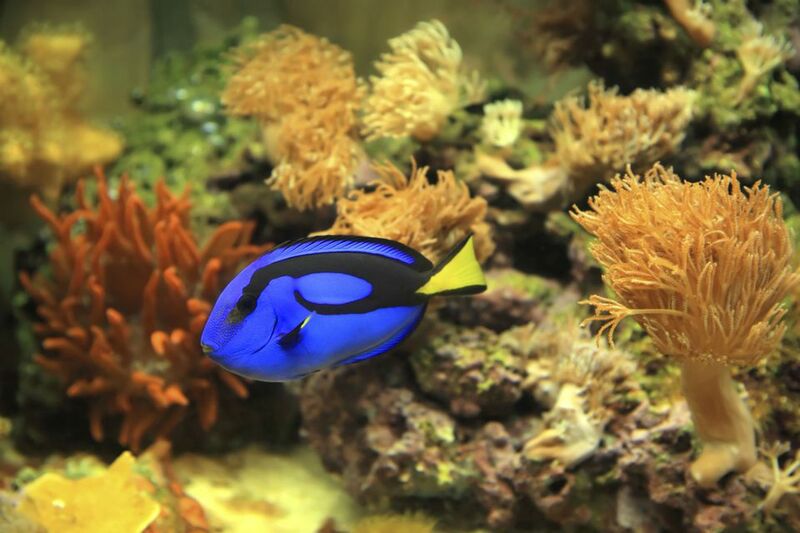 You have probably spent time trying to determine where you would like to put your new saltwater aquarium. In the entry? Against the wall in the parlor? As a room divider? Perhaps built into a wall? Freestanding in the middle of a room? Or maybe a micro reef on the corner of your desk? When you start thinking about it, you can put an aquarium just about anywhere. Use your imagination! Aquariums weigh a lot. Saltwater (SW) weighs about 8.5 lb/gal. You also have to add in the Live Rock, substrate, glass or acrylic, equipment (skimmers, pumps, lighting) and the stand to find your real weight. Check the supporting structure under the floor. Try to place your tank next to a bearing wall or over a supporting piling or cement foundation wall. Is your tank going to be the focal point of the room (face it, a 5,000g tank in the middle of the room is going to attract attention), or more of a side attraction, placed within easy viewing from the sofa? Placing a tank where it will receive direct sunlight can cause a lot of water temperature as well as algae problems. Look at the traffic pattern in the room. Is your tank going to be an obstacle in the path to the refrigerator or bathroom? You're going to need an electric supply for your tank (lights, water pumps, air pumps, etc.). The closer the tank is to an outlet, the better. If the desired tank location isn't within a few feet of the existing outlets, you might want to consider installing another outlet. If the tank is placed away from a wall, you will want to install an outlet in the floor, under or next to the tank. Keep your tank out of the direct airflow from either the heating system or A/C. Keeping your tank temperatures steady is very important. Any sort of draft over or around your tank will only add to your temperature fluctuations. Moving a tank of any size can be a major project and is an aquarist's nightmare. Plan ahead and do it right the first time. Keep your tank at least 4-6" away from walls. This will allow room to clean the back glass as well as hang various equipment on the back of the tank. Clear out the area where you think you want your new tank to go. Clearing the area will allow you try out the location for a few days. If you want to create a more realistic simulation, stack some empty boxes where the tank will be placed to mimic a tank and stand. Paint in the aquarium on the top boxes, complete with fish and other critters. Have some fun with it! Now that you have your tank location figured out, you need to go on to determine the size of your new tank.